The critical mass bag is the large (22L) and redesigned version of Patagonia’s half mass bag (15L), other than size, the big difference is that the new critical mass bag has two shoulder straps (like a regular backpack). This bag is great for those who want to transport gear in style, and makes it a great choice for those who do not want to want to lug around a briefcase for work. You can fit all your work stuff in here and more. This bag is very roomy. 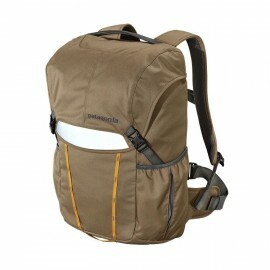 This bag is very light, weighing in at under a kilogram or 2 lbs, given the amount of goods you can carry in it. This is a great commuter bag if you need a really big bag – great commuter bags are hard to find, but this one comes very close. It is a great size for carrying up to 17″ latptop, several books, jacket, extra layers, lunch and coffee thermos and mug, not to mention all your power cord and other office stuff. Very comfortable to wear. Handy laptop padded sleeve, tons of little storage pockets for odds and ends including two exterior mesh pockets for your water bottles, shoes, or sweaty post workout clothes . For those minimalists who want to transport their gear in style. 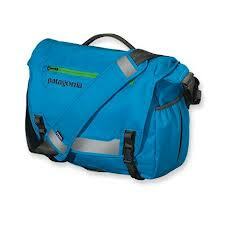 The Patagonia Half Mass bag is very light given the amount of goods you can carry in it. 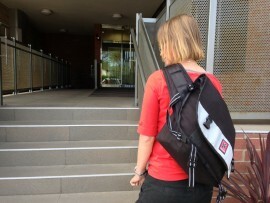 It is surprisingly hard to find a great commuter bag, but this one comes very close. It is a great size for carrying a latptop, a couple of books, jacket, extra layers, lunch and coffee mug. Very comfortable to wear, and the carry handle option is great to have. Handy computer sleeve, tons of little storage pockets for odds and ends. Review of Atom Sling Bag from Patagonia: convenience of a messenger bag with stability of a backpack. The Patagonia Atom is a great bag for people on the go, providing the support of a backpack with the convenience of a messenger bag. 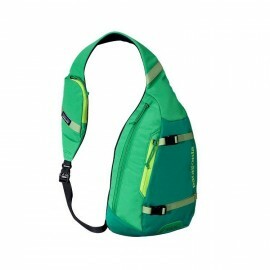 It’s small and convenient and is easy on your shoulder thanks to it’s teardrop shape. To access the contents of the bag simply spin it around. Very convenient! 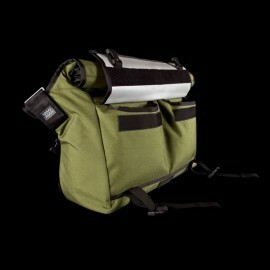 The medium sized, roll-top messenger bag from Mission Workshop is a true to form messenger bag. Mission workshop is a company based out of San Francisco that produces bike related products, and are widely known for their messenger bags. The main distinguishing feature between this bag and other messenger bags is it’s large, roll down top cargo compartment. This particular bag comes in three sizes: the Shed is the large (35 L), the Rummy is medium (27 L) and the Monty is small (21 L). They all come in a choice of five colors. Here is our review on the Shed bag. 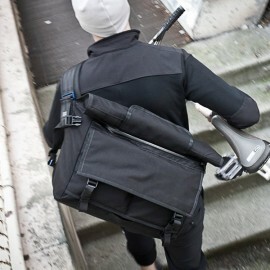 The large sized, roll-top messenger bag from Mission Workshop is a true to form messenger bag, and one of their biggest. If you are looking for a very large messenger bag, consider the Shed due to not only it’s size but also the comfort features of carrying. Mission workshop is a company based out of San Francisco that produces bike related products, and are widely known for their messenger bags. The main distinguishing feature between this bag and other messenger bags is it’s large, roll down top cargo compartment. This particular bag comes in three sizes, the Shed is the large (35 L), the Rummy is medium (27 L) and the Monty is small (21 L). They all come in a choice of five colors, and seven buckle colors. Metropolis and Citizen are the original, and iconic messenger bags from Chrome. I have both models, and will review them here. The only difference between them is size: the Citizen is a size medium – 26 L capacity – and the Metropolis a size large – 40 L capacity. They are identical in every other way. Also worth mentioning is the Mini Metro bag. At 20.5L is the smallest messenger bag they make.